A comprehensive UHD, 4K, HDR movies and TV shows copy or recording solution with software or hardware. How to watch 4K Ultra HD(UHD) Blu-ray? You need three things: an Ultra HD(UHD) Blu-ray player, an Ultra HD TV and some 4K UHD discs. First, you’ll need to make sure your TV supports HDMI 2.0 standard or above. Most of TVs released from last year to now have supported HDMI 2.0, but the old models released before 2014 might not support. Check your TV manual or Google the model number to find out – the even newer HDMI 2.1 standard should be fine. Also, only the newest TVs released after 2016 support HDR technology. That’s because HDR requires TVs that can display more colours and have a higher peak brightness. You can still enjoy Ultra HD Blu-ray without an HDR-ready TV, but you will not enjoy the benefits of HDR. Finally, there are only a few Ultra HD(UHD) players for purchase in market – The still impressive Panasonic DMP-UB900. The newer, equally excellent Panasonic DMP-UB700. The slightly cheaper, but still very good, Samsung UBD-K8500. Have the 4K video content in Ultra HD(UHD) Blu-ray been encrypted? Yes, 4K Ultra HD(UHD) Blu-ray uses newer AACS 2.0 encryption method than before. Should I buy an expensive Ultra HD Blu-Ray drive for my 4K UHD discs? Most of Ultra HD Blu-Ray drives are all expensive. If you want to save your money, an alternative method is to use a kind of special cheaper optical drive. we call the optical drives as UHD friendly drives. Here are some UHD friendly drive lists (Latest UHD friendly drivers lists). If you have owned these UHD friendly drives released before 2017 and they have never been upgraded firmware, congratulations, they are definitely UHD friendly drives for Ultra HD(UHD) discs. Don't upgrade the firmware of the UHD friendly drives, or you will regret it. Because after the firmware upgrading, your drives will no longer identify the Ultra HD(UHD) discs. Can I buy a new UHD friendly drive which has been downgraded? 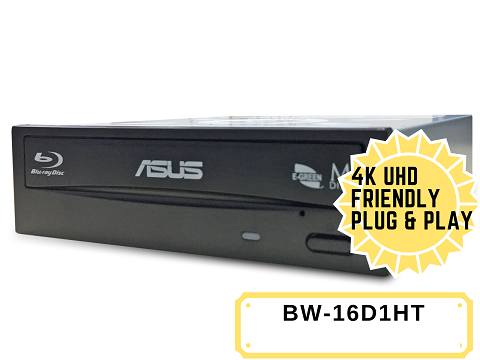 If you want to make things to be easier, Plug and Play UHD friendly drive BW-16D1HT and BC-12D2HT is highly recommended. How to copy Ultra HD(UHD) Blu-ray with UHD friendly drive? Blue-Cloner is recommended for copying Ultra HD(UHD) Blu-Ray. It provides a variety of copy methods, such as 1:1, movie only, etc. In addition, its unique data caching technology can reduce the loss of the optical drive. See how to copy uhd blu-ray. DVD-Cloner has supported Ultra HD(UHD) Blu-ray ripper function since DVD-Cloner 15.10.1433 version was released.